Freibergs Disease | WILL I EVER DANCE AGAIN? Freibergs disease appears to be a relatively uncommon condition affecting the bones of the forefoot. Although it is seen more commonly in girls aged 12-15 years it can present into adulthood also, again mainly affecting women. This condition affects the articular surfaces of the second or third metatarsal heads leading to collapse of the bone in this area. The second metatarsal is more commonly affected. It is rare to be affected in both feet. The main symptoms are forefoot pain. This constant dull ache can worsen especially at the end of joint range movement. There can be an area of localised tenderness on palpation over the met heads. It may be possible to see the development of calluses in this region too. The joint may feel and become stiff over time. Symptoms usually worsen over time. However in some cases there are no symptoms present, and other cases may resolve spontaneously prior to even seeking treatment. Pain is often noticed initially with dynamic exercise such as running, but can progress later with walking or even standing. Diagnosis will rely on the presenting symptoms as mentioned previously:- Symptoms of activity-related forefoot pain with passive motion of the MTP joint and pain with palpation over the metatarsal head. X ray can also be useful in diagnosis. In the early phases a small fracture may be seen within the bone. 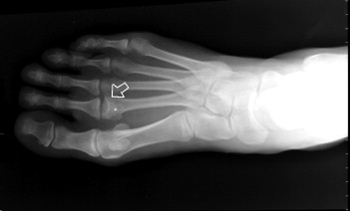 In later stages xrays reveal flattening of the metatarsal head and joint space narrowing and irregularity.. Varying degrees of thickening of the metatarsal shaft may be present as a result of a period of abnormal stress along the metatarsal. It is important to get the diagnosis correct as there are other forefoot conditions such, Mortons neuroma, stress fracture of the metatarsal,sesamioditis and synovitis of the joints that have similar symptoms. In the early days of the disease process the problem can be treated conservatively with immobilisation in a cast. In later stages, a metatarsal pad can be used to offload the met heads. Low heeld shoes are also beneficial to reduce the stress on the 2nd met head. This should be continued during athletic activities until the epiphysis closes and symptoms settle down. NSAIDS (non steroidal anti inflammatories) may help relieved discomfort from swelling. Surgery is only indicated if pain persists after conservative management or the met head becomes deformed. Surgery entails removing fragments of articular cartilage and rejoining the upper part of the metatarsal head, to allow the joint to move freely and painlessly. Recovery again will vary depending on the route of treatment taken. As mentioned previously the problem may resolve spontaneously without any treatment being required. Recovery with conservative management will vary from case to case. I may take up to 12 weeks to settle with modifications to footwear. If surgery is required (less common option) recovey will follow in the guidlines of the surgeon but will no doubt follow a period of immobilisation followed by some intense physical rehab. As the onset to this problem is poorly understood it is difficult to state any preventative measures.